Salmon is my husband's favorite fish. I can probably say it's my favorite too. Very little needs to be done to it in order for it to have extraordinary flavor. However, knowing me, I like to be extra. 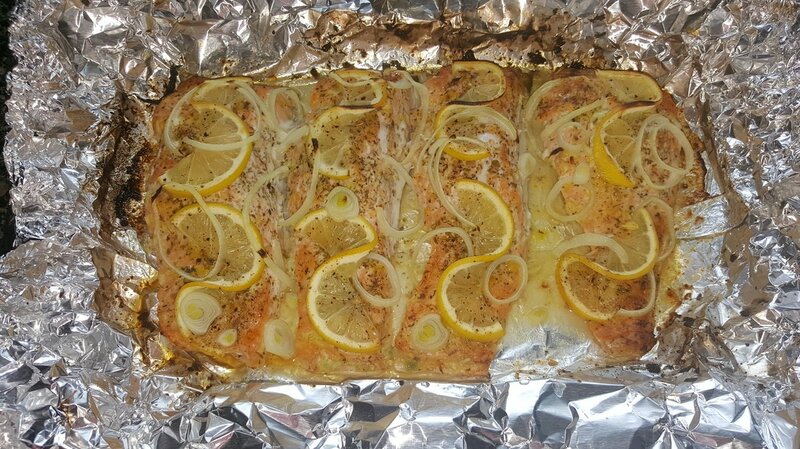 I have experimented dozens of time with salmon trying to find the perfect combination of spices just to please my husband. He really does love this fish. When my uncle gave me this recipe he came up with, I can honestly tell you that my search is finally over. Out of all the salmon I have had in my lifetime, this is absolutely the best! If you don't try anything on my website, I at least implore you to try this one. Yes, it's that good!! It's bursting with flavor inside and out, flaky and juicy on the inside, and that combination of lemon and garlic is to die for. All this and more just from being baked and broiled. 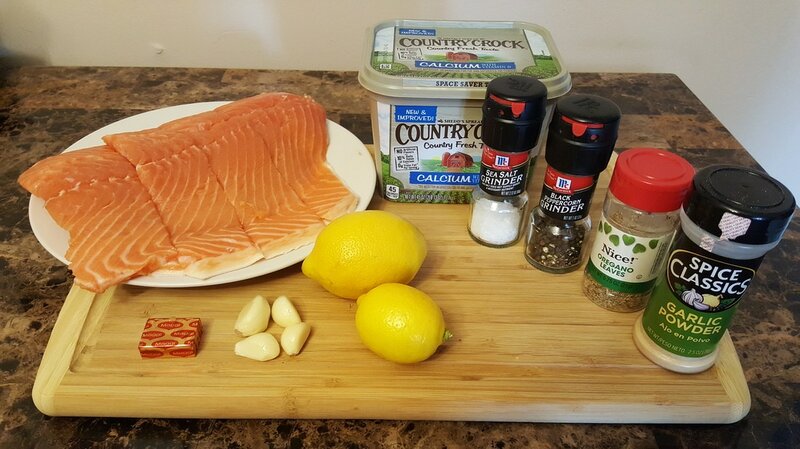 I don't want to over hype this salmon recipe but it has become one of my personal favorites. 1. Using a fresh slab fillet of salmon, nice and thick, is best for this recipe. The spice measurements are for 2 lbs. worth of salmon. I prefer to cut these into 4 pieces (about half a pound each). 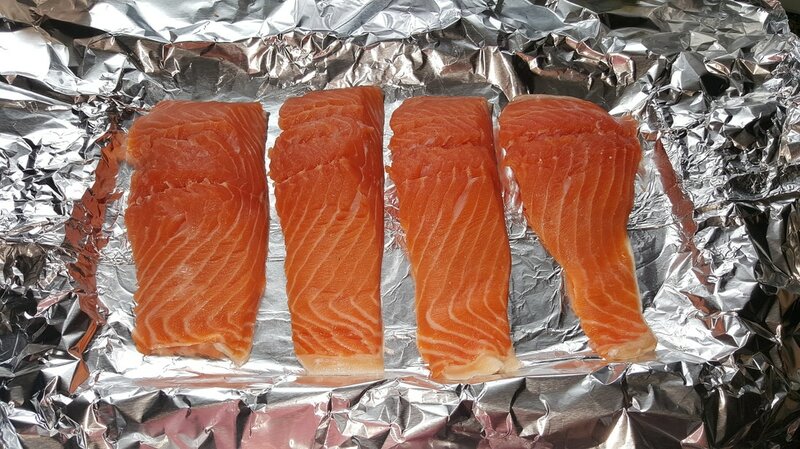 You can cut them smaller if desired since the seasoning will still cover the full 2 lbs., but the 4 pieces is still best. Ensure that the salmon is free from scales on the skin side and if it was rinsed off, pat it dry. 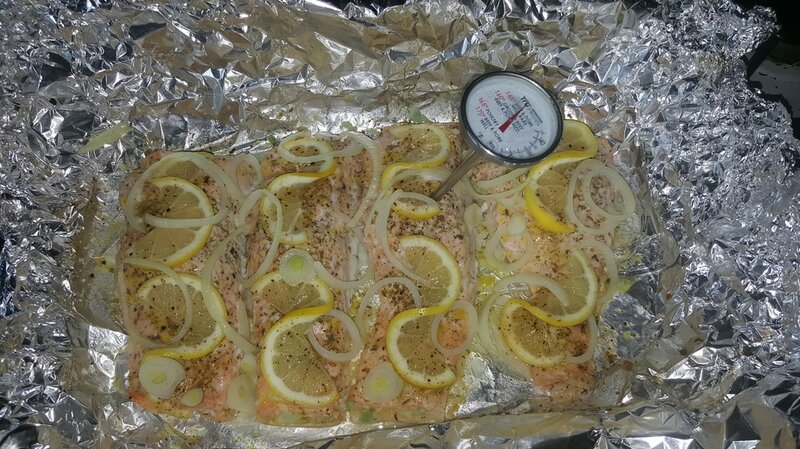 Lay the salmon on a foil lined baking sheet. 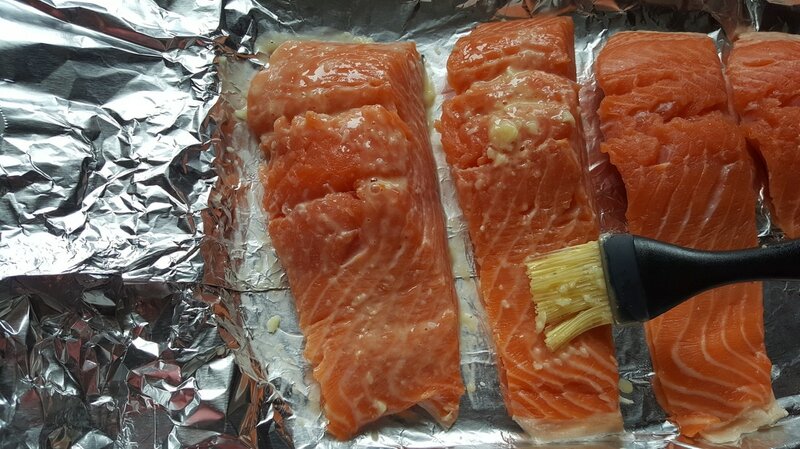 Make sure the foil is large and wide enough to be able to encase all the salmon in a packet. You can also wrap them up individually as another option. ​2. Prepare and set these other ingredients aside: 4 tsps. 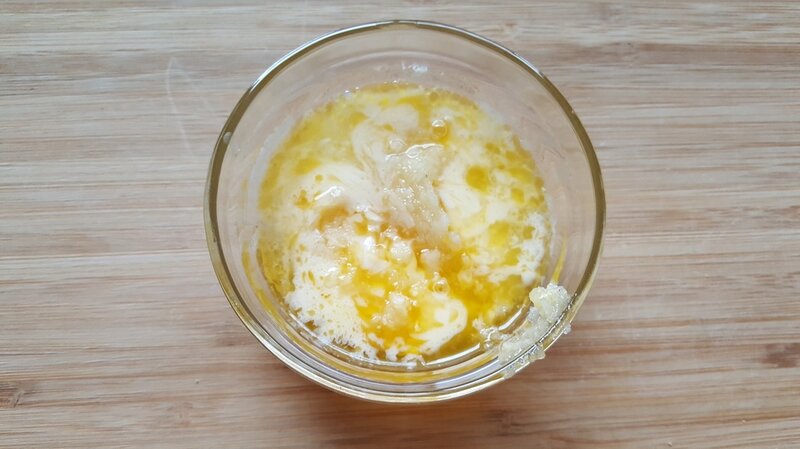 of softened butter, ¼ - ½ tsp. of garlic powder, 2 tsp. of oregano, and finely crush 4 garlic cloves. Take 1 Maggie chicken bouillon cube and crush it until it is fine and crumbly. (*Note: Maggie comes in 2 forms - a hard, crumbly version and a soft, dissolvable version. 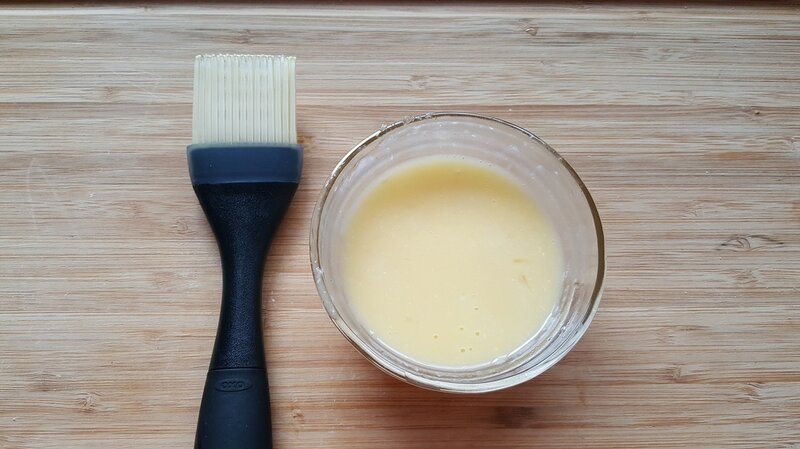 In a lot of my other recipes, I’ve been using the dissolvable version which I usually dissolve it in a little bit of liquid before using it since it was too pasty for me to sprinkle it. For this salmon recipe, it is a must to use the hard, crumbly version!) Once the Maggie has been crumbled, remove ¼ tsp. and set it aside. You can save the remaining Maggie for other recipes. Juice 1 lemon and reserve about 2 - 3 tsps. of the juice. ​3. 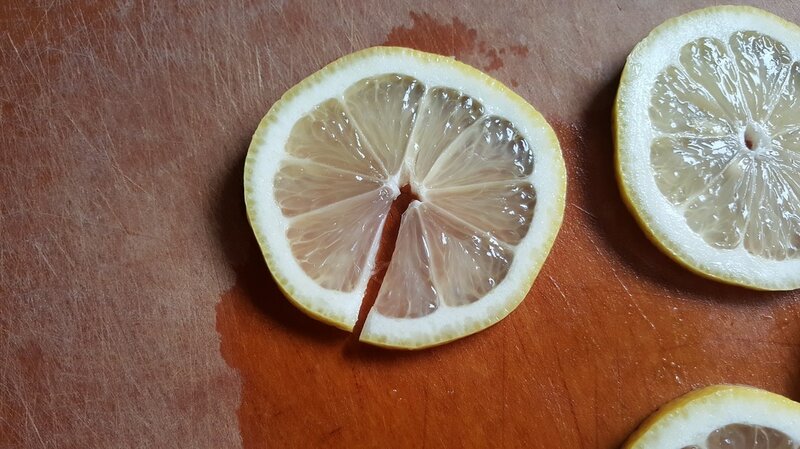 Slice the 2nd lemon into thin slices. 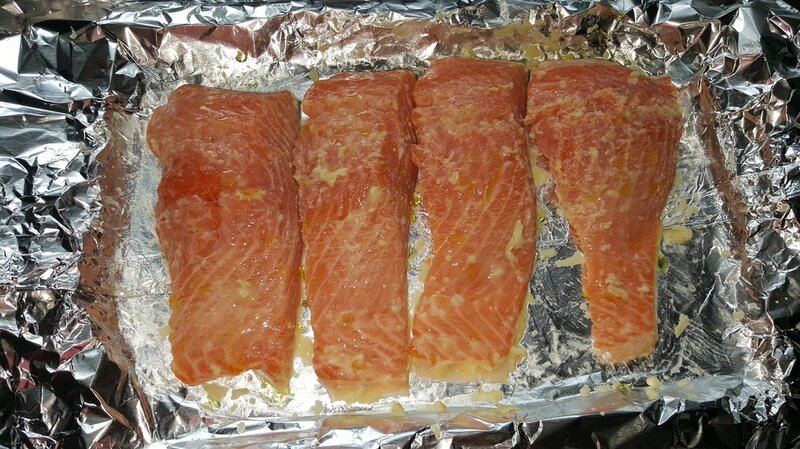 For the 4 pieces of salmon, you will need about 8 (2 slices each). 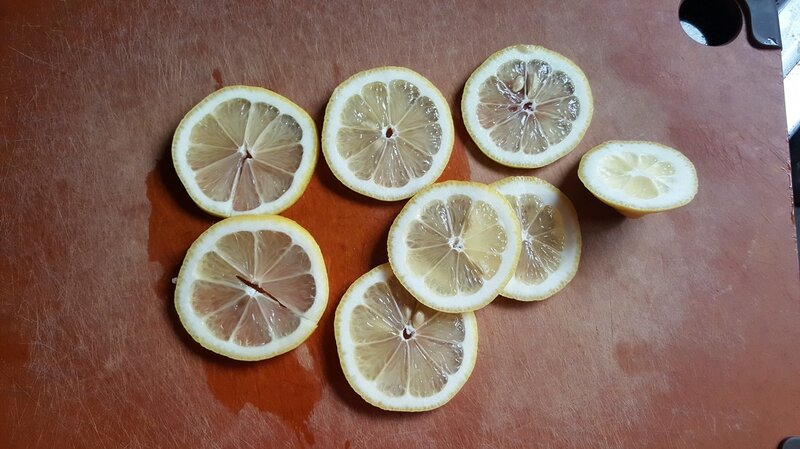 After slicing each lemon, take each slice and cut halfway through each lemon. Remove seeds if desired. Set lemons aside. ​4. 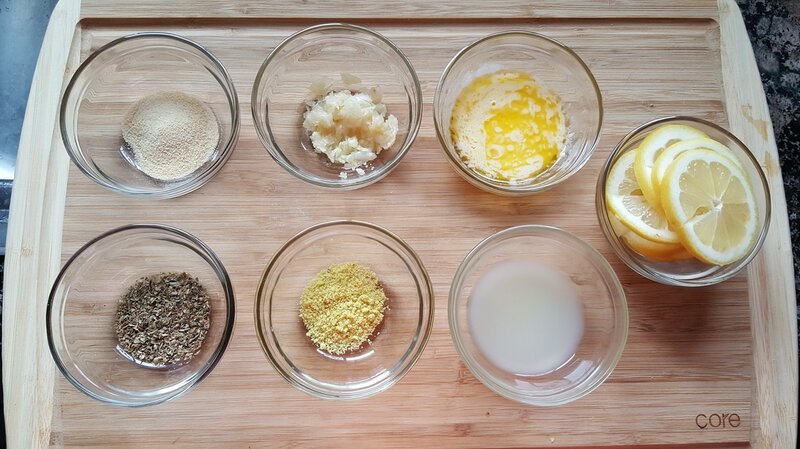 Combine the crushed garlic cloves, lemon juice (2 - 3 tsps. ), and softened butter. Mix contents well with a spoon. ​5. Using a basting brush, brush the lemon/garlic/butter mixture onto all sides of the salmon. Follow by drizzling a little olive oil on it as well. ​6. Sprinkle on the remaining spices evenly: oregano, crushed Maggie, and garlic powder. Follow by sprinkling freshly ground black pepper and ground sea salt sparingly. A lot of the flavor also comes from the Maggie but you still want to add enough salt and pepper to taste to penetrate and flavor the salmon all the way through. ​7. 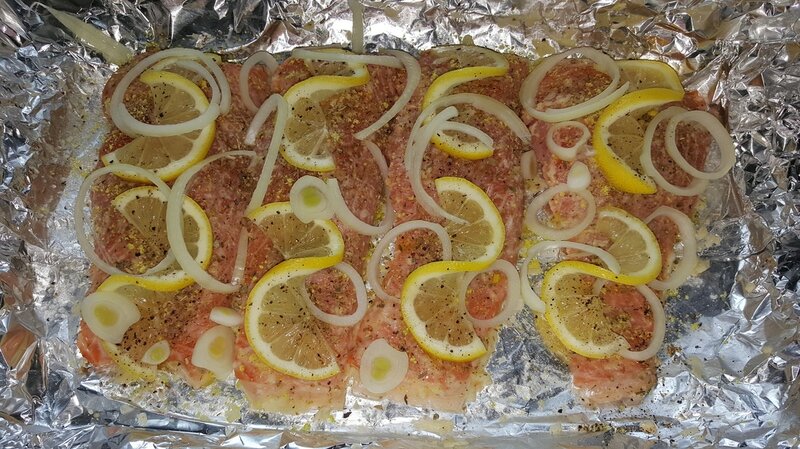 Add lemon slices (2 per piece) as well as onion slices. ​8. 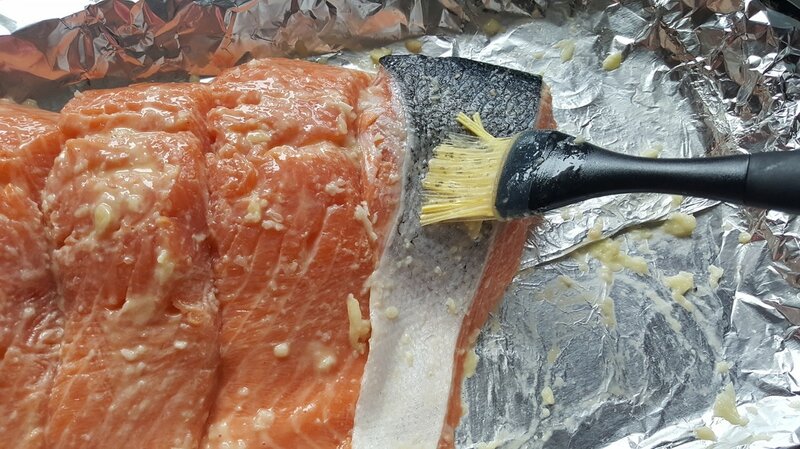 Wrap foil around edges to enclose the salmon as if making a steam packet. As mentioned before, you can also wrap the pieces individually if desired. Place in a 350 degrees preheated oven and bake for about 20 minutes. ​9. 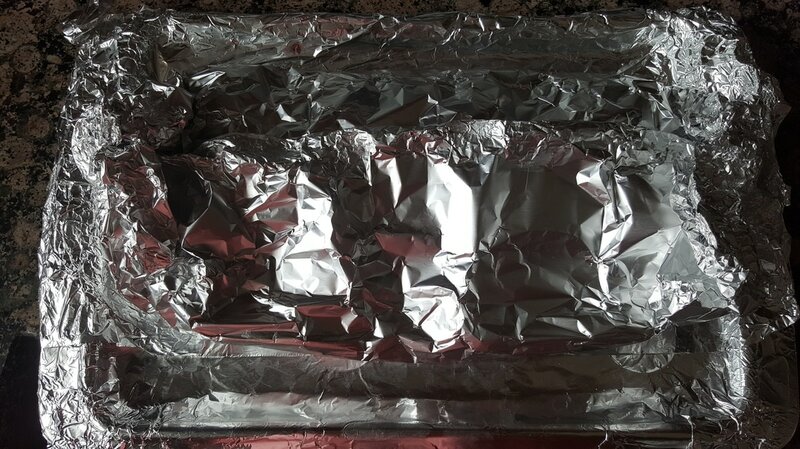 Remove from oven and open foil packet. Fish is done when it reaches internal temperature of 140 degrees. It should be close to it after 20 minutes. Return fish to oven on high broil to crisp up the top and slightly develop a darker color for about 5 minutes. Watch it closely! It will usually hit the internal 140 degrees after broiling. Take care not to overcook the salmon to keep it from drying out on the inside. 10. 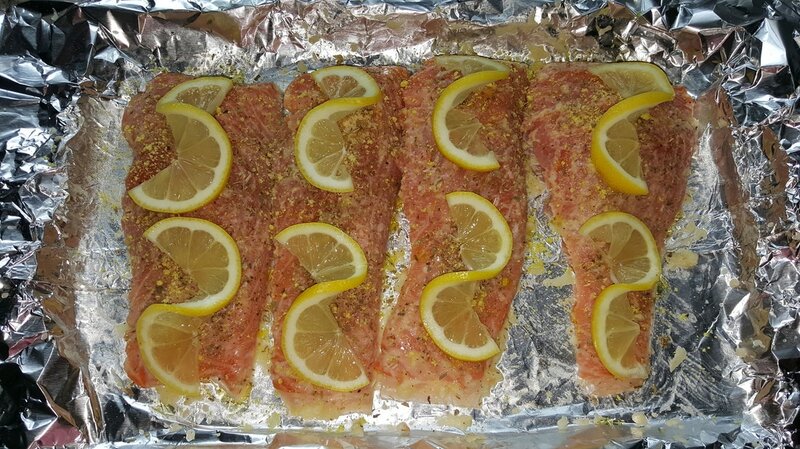 The salmon is now ready to be enjoyed. Options to serve your salmon include a side of white rice or mashed potatoes and your choice of vegetables like green beans with bacon. Serve immediately and the salmon will be bursting with flavor and juices to every last bite. What are your thoughts on this recipe? How do you like your salmon?